Despite an official ban on the production and use of polythene bags in Dhaka, some 250 factories are still illegally making and supplying these bags to approximately 6,000,000 city dwellers every day. On average, 52% of the bags are used only once, and then discarded into drains and canals across the city, ultimately flowing into the Buriganga. The non‐degradable polythene bags sink to the riverbed and accumulate, thus creating dead zone layers along the river bottom. The layer is estimated to be up to 2 meters deep in some sections of the Buriganga. Majority of the industries of Bangladesh are located on riverbanks. There are approximately 2,500 factories located on the rivers surrounding Dhaka reported by different government agencies. 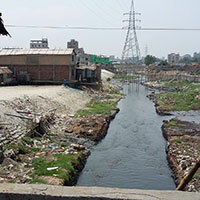 Due to the lack of enforcement of environmental laws in Bangladesh, industries are not held accountable for maintaining adequate waste treatment facilities, and they find it easy to discharge untreated effluent into the rivers. At least 400 industrial plants are discharging untreated wastewater directly into the Buriganga. The most significant source of industrial pollution on the Buriganga is from tanneries within the Hazaribagh area in the western part of Dhaka. In Hazaribagh, there are more than 240 tanneries situated on 25 hectares of land along the riverbank. Tanneries employ chemical intensive production methods, which leave harmful byproducts in high‐volume effluent: several classes of solids, nitrogen compounds, neutral salts, chromium compounds, solvents, oil and grease. These effluents will cause severe damages on riverine ecosystem if left untreated. Every day, more than 7.7 million liters of untreated toxic liquid and solid waste flow into the Buriganga from unregulated tanneries.